The Curva Sud set the tone for this game by spelling out “Basta,” which means “enough!” in Italian. As in they have had enough. And they put the exclamation mark on it by walking out midgame, too. But I’ve had enough of their spoiled entitled antics. When they walk away from the game, they lose my respect, too. We get it. We’re all angry, frustrated, heartbroken, disgusted, and at least 20 other adjectives you could use to describe this club right now. But if we are truly fans of Milan, we will still watch, no matter how painful or what lengths we have to go to. Some of us know that we have been spoiled, and now we are going to hurt. For some of us, it is enough to know that changes are on the horizon, but for others, it is never enough. 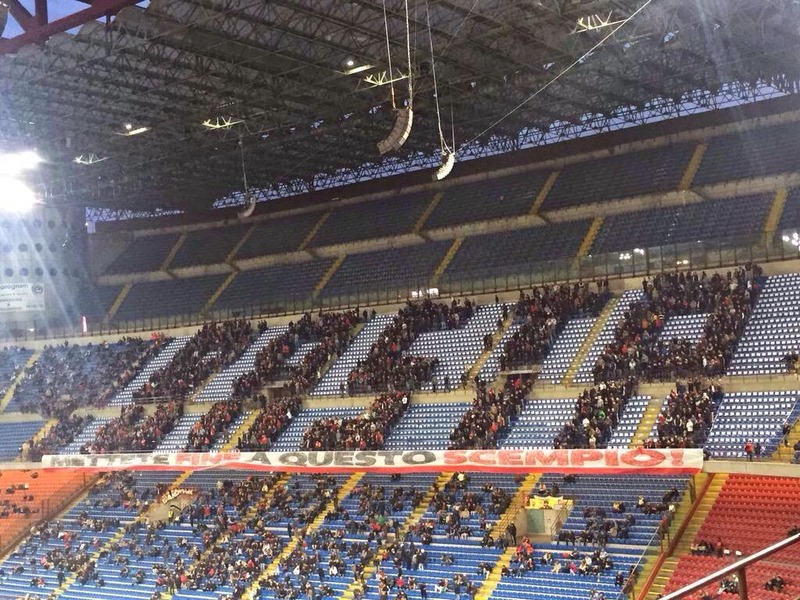 For example, for the Curva, Galliani’s demotion on Tuesday apparently meant nothing. The fact that their owner was in discussions with a potential investor during the game wasn’t enough, either. And learning the impact of the club’s €91m in losses last year that were due to wages owed technical staff who had been fired in 2014 means nothing to them, either. The fans who heard that news on Tuesday then called for Inzaghi to be sacked the following day may want to be checked for Attention Deficit Disorder. It’s as if they believe that if they don’t watch the games, then somehow we will get a new owner, manager, and a whole new team overnight. It is more than obvious that changes are being made, but for some spoiled and entitled fans, it is never enough. The game was horrible, it wasn’t ever going to be fantastic. Well Diego Lopez was fantastic. And worth watching the match simply for his amazing saves. But in the 37th, Bertolacci just schooled our defense to score, 1-0 Genoa. In the 49th, some kid called Niang stole Costa’s thunder to tap it in, 2-0 Genoa. 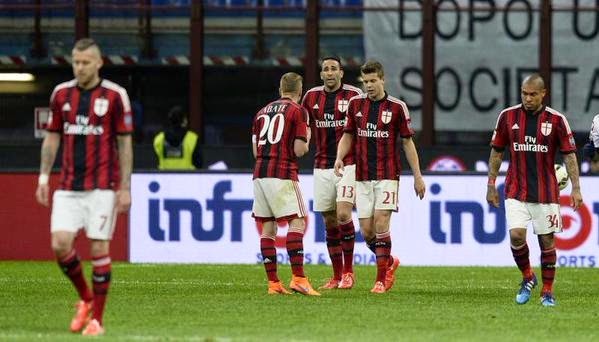 In the 66th, though, Milan’s favorite striker defender Mexes scored a great goal to give fans hope, 2-1 Genoa. I think that’s when the Curva left for some inexplicable reason. But, as Mexes only seems to be able to score in a game that he’s also conceded, in the 93rd, the last minute of stoppage time, he conceded a penalty. Iago Falqué stepped up and converted it to give Genoa the 3-1 win, their first win against Milan at the San Siro in 57 years. Who says this Milan team isn’t making history? But that’s not all. Giacomelli dished out a total of 8 yellow cards, including on to Abate in stoppage time, two to Menez, the second of which was not only questionable, but of course left Milan on 10 men for the last 20 minutes. But if he hadn’t been sent of, Mexes would have, as both players fouled on that play. Mexes also should have received a yellow when he conceded the penalty, the man wanted to see red so badly, he got a head wound late in the game and was bleeding and had to be bandaged up. These are all significant yellows because in addition to Menez obviously being suspended for Napoli on Sunday, so will Mexes and Abate sit due to card accumulation. Yes, I've had enough of you, too. As we discussed on the last podcast, it is not easy to be a Milan fan right now. But many fans, and especially the Curva Sud, have become like the spoiled rich kids who claim to be fans of Apple products, but won’t buy the new iPhone because it won’t support something they can get on an Android phone. They’re not ready to switch to Android, but they’ll keep complaining about the iPhone, even though an upgrade is on the way. I grew up poor. I hate spoiled rich kids. And I don’t care what kind of phone you buy with daddy’s money, just stop pretending to be a fan of my club if you’re not going to stick it out and watch the games no matter what. You're making things worse for the team you claim to love. You’re embarrassing yourself, the club, and me. I will always bleed red and black, no matter how poor the team is. I would die to have the chance to go to San Siro for every match. But for some fans, getting to watch Milan in good times and bad is never enough. Udinese-Milan Preview: Bottom Table Bullies? 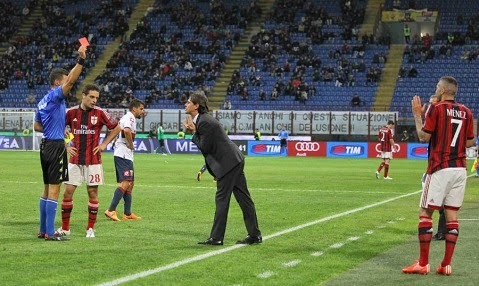 Inter vs. Milan: Stop Thief!